Hole 1 -- A nice opening hole, play smart with a 200 yard club to the center cut of the fairway and you will have a short iron or wedge from a flat area to the green. Walk away with a safe par to start your round. Hole 2 -- The number one handicap hole at Eagle Springs, this par 5 requires a long, straight drive, followed by a blind second shot to the middle of the fairway. Be happy with par on this tough hole. Hole 3 � With a straight drive here, this hole can be driven. Be careful for the greenside bunker though as it is a common landing area for the driver. Hole 4 � The key to this hole is club selection. Play this downhill hole right and your looking at a birdie. 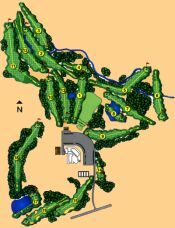 Hole 5 � Play an iron or fairway wood to the turn on this dogleg par 5. A safe second shot will give you a chance to fire at the flag. Going for it in two is near impossible as the green is very elevated. Hole 6 � On this straight uphill shot hit the fairway. Left is a wooded area and right is worse. Drive this green and you will have bragging rights!! Hole 7 � This tough par 4 demands a perfectly placed tee shot to the right of the lake. Short is safe on your approach because behind the green awaits large pine trees. Hole 8 -- Club selection is vital on this par 3. Come up short and the large lake can come into play. Go deep and long grass may eat your ball up!! Hole 9 -- On this uphill par 4 keep your tee shot to the left side of the fairway to stay away from the large fairway bunker. From there, hit your approach shot to the right to stay clear of the front and back left bunkers. Hole 10 -- This tough hole to start the back 9 requires you to hit a good tee shot to the left of the fairway that runs hard right. A narrow shot to the green awaits you from the fairway. Hole 12 -- This demanding hole requires a good tee shot to the top of the hill. From there play safe to the center of the green. Do not miss left or you are in trouble!! Hole 13 -- This par 4 plays downhill then back uphill with a great look at the clubhouse. Avoid water left and enjoy the view. Hole 14 — This short par three has a green that slopes from front to back. Fire at the pin on this hole. Hole 15 — On this slightly downhill par 4 hit a club less than you think as iron shots will run through the fairway if you are not careful. From the fairway play a short iron or wedge into an uphill green. With a good tee shot, birdie is very possible. Hole 16 — This risk/reward hole is very straight forward. Long hitters can drive the green from the forward tees but beware, hit it right and par becomes almost impossible!! Irons are the smart play here. Hole 17 -- The signature hole at Eagle Springs plays 189 yards from the back tees. This scenic hole plays completely over the lake to a large angled green that runs from back to front. Club selection is key here. This dogleg par 5 is a great finishing hole. Safe players can lay up short of the bunker to a wide fairway for a true three shot hole while the daring players can attempt to play a fade around the turn and go for the green in two. Your approach shot can be deceiving to an elevated green with not much room for error right or left. Par here is good as birdies are rare! !